I haven't written in awhile because I have been pretty busy! Last week I painted in the Franklin Garden Walk. I made two small sketches (one is at right) and then I worked on a larger version. 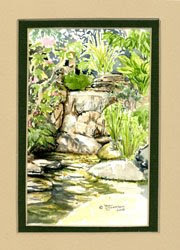 The garden I was painting in was truly peaceful and lovely. It was on an extreme hillside with a koi pond at the top of the hill just outside the back door of the home. Then a series of waterfalls led the water down the steep slope to this little waterfall and pond which is what I wanted to study and paint. The ravine went far beyond this little scene and was so steep it wasn't gardened, just wild. The water from the man-made waterfalls recirculated back up the hill from this little scene at right, to the koi pond again. A beautiful bolder pathway led you down through lush plants alongside the waterfall. Little frogs were everywhere as you walked along the path, jumping into the pools of water here and there. The home owners said I could come back anytime to paint again. I certainly hope I can do that!!! I have this little sketch framed and for sale in my etsy shop. The home owners will have first dibs on the larger, more finished work in a few weeks. To see the sketch in it's frame visit my shop by clicking the etsy shop link at the left of this page.